Coverage includes Lakes Entrance, Lake Tyers, Loch Sport, Lake Wellington, Tambo Mitchell & Nicholson Rivers, lake King, Ocean Grange, Lake Victoria, Lakes National Park, Paynesville, Metung, Bairnsdale, Sale, etc. 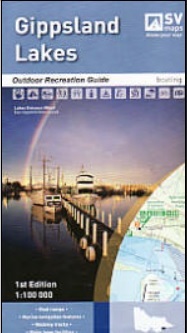 Inset enlargements cover Lakes Entrance, Metung to lakes Entrance, Bunga Arm campsites, Metung, Nicholson Mitchell & Tambo Rivers, McLennan Strait, Paynesville & Aurora Channel, Loch Sport & Rotamah Island. Features and symbols include Roads, Tracks, Walking Tracks, Camping areas, Notes on boat navigation and walking, buoys and markers, depths, navigation lights, facilities, land tenure, waterways etc. Scale: 1:100,000 (main map) and enlargements at 1:10,000; 1:12500; 1:20,000; 1:25,000.